Since I already have the Japanese edition of this book オブ 借りぐらしのアリエッティ, I borrowed the English one from Basheer Graphic Books for this review. You can order the book from them. Check with Basheer on Facebook or visit their website. This review is going to be similar to the one for the Japanese book. What's different here is the cover art, and also the dust jacket is smooth instead of textured. It's translated by VIZ Media who does a good job, as usual. The book has 248 pages but only 208 pages are on the art with the rest being the script. The film's directed by Hiromasa Yonebayashi, a new director. The book's loaded with colourful concept art. There are character designs, storyboards, background paintings and film stills. Much of the concept art is in pencil and watercolour as usual. I see some drawn by Hayao Miyazaki but the rest seems to be drawn by others -- I could be wrong. The drawings are captioned but not credited. The art is beautiful, of course. Characters designs are wonderful, cute, and pastel colours are nice. One thing with the character design is, they seem to look very similar to previous films from the studio. Looking through the book, I kept thinking that the characters here are the same "actors" as previous films but set in a different script. 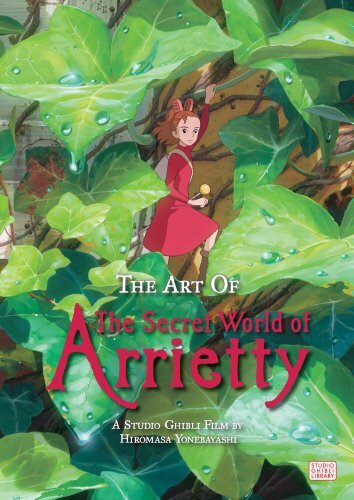 Arrietty's the main character and she's a tiny person. So it's interesting to see how household items are incorporated and used as gadgets. The storyboards are great, really telling the story without any words. Just by looking at them, you know the story or idea works. Afterall, this is concept art. The background paintings are of lush green countrysides, which you could really mistake them for coming from Spirited Away or Princess Mononoke. And there are paintings of Arrietty's home and the different locations. The art direction is unmistakable, uniquely Studio Ghibli. It's a beautiful book for fans of Studio Ghibli.